Whenever I think of New Orleans, where I spent many a weekend pass while defending the Southern Coast of the United States from an invasion by the Viet Cong, I think of food. Of course, I also think of music, drinking and having fun with my Air Force buddies, but mostly I recall the exquisite meals at Brennan’s, Antoine’s, Galatoire’s and the dining room at the Royal Orleans Hotel, as well as beignets (think unfilled zeppole) at Café du Monde at 4:00 am. I don’t know if those memories stem from the fact that any meal outside of the Keesler Air Force Base mess hall would be memorable, or from the fact that I was exposed to the cooking of a whole different region of the country; the French, Cajun, Creole influence and the use of spices and flavors theretofore unbeknownst to me. Whatever the reason it was a great experience and helped to influence my culinary choices beyond those learned in my mother’s kitchen. I would be remiss to not also mention Mary Mahoney’s Old French House in Biloxi, which was our local respite from the uninspiring cuisine of the mess hall. Rémoulade is one of those new tastes about which New Orleans taught me. Apparently, it was originally a French relish-type sauce that was adapted in the Creole fashion by adding a Louisiana Hot Sauce like Tabasco, or cayenne pepper to spice it up. There are innumerable recipes for it on-line, but the one I developed is easy to prepare, takes about 10 minutes, and can be made in advance, as long as it is refrigerated. 1. Prepare the Sauce Rémoulade by combining the 6 ingredients in a small mixing bowl and whisking together briskly. Chill for 30 minutes. 2. In the meantime, to a 4 qt. or larger mixing bowl, add the crab meat, scallions, peppers and breadcrumbs, mix well with a small rubber spatula. 3. To a small mixing bowl, add the mustard, lemon juice, paprika and eggs, whisk together briskly. 4. Pour the wet ingredients into the dry, add black pepper and mix well again. 5. Form the mixture into 6 or 8 cakes, each about the size of a good-sized hamburger. 6. Add the olive oil to 12 inch non-stick frying pan and heat on medium high. 7. When the oil is shimmering, add the cakes and cook for 3 to 4 minutes. 8. Lower the heat to medium, turn the cakes and cook an additional 3 minutes until nicely browned. 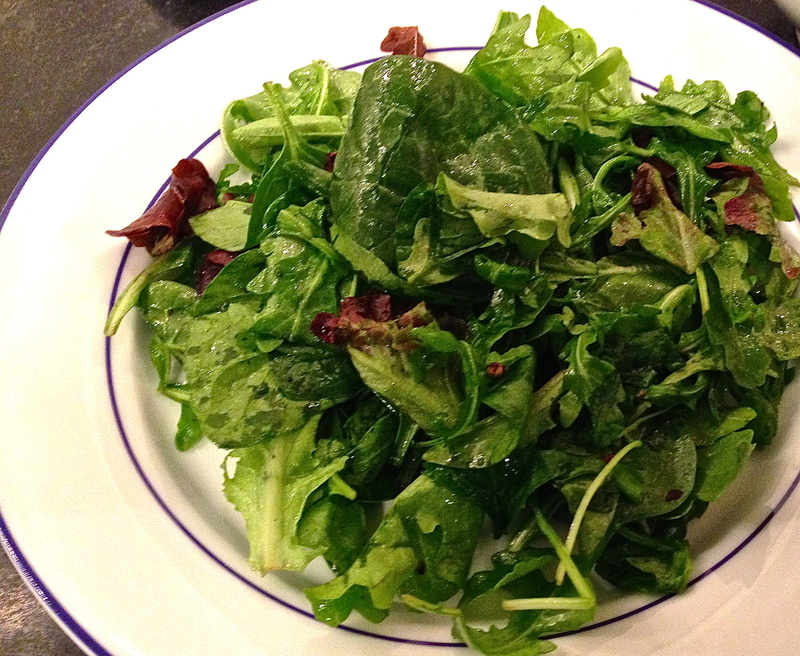 Serve the crab cakes over a bed of mixed greens tossed with 4 tbsp. of extra virgin olive oil and 4 tbsp. of champagne vinegar. 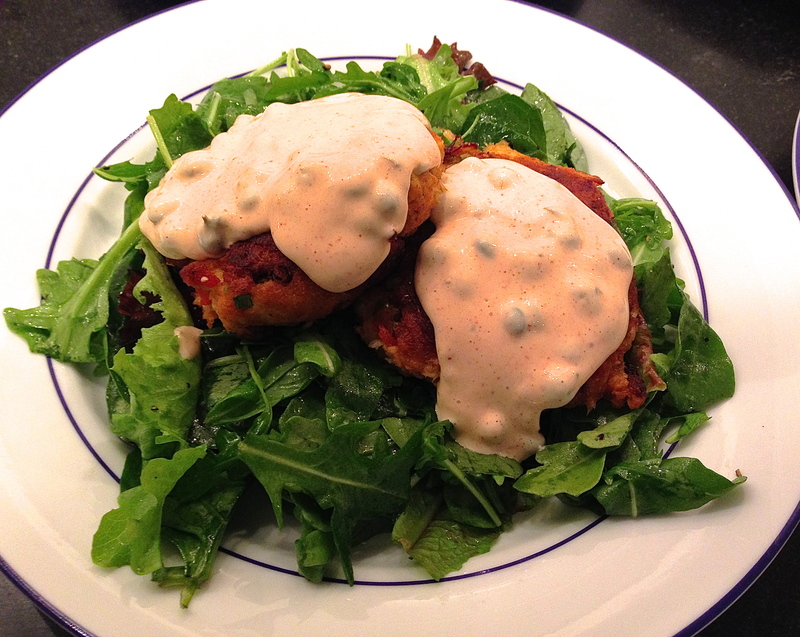 Top each crab cake with several spoonful’s of the Sauce Rémoulade. 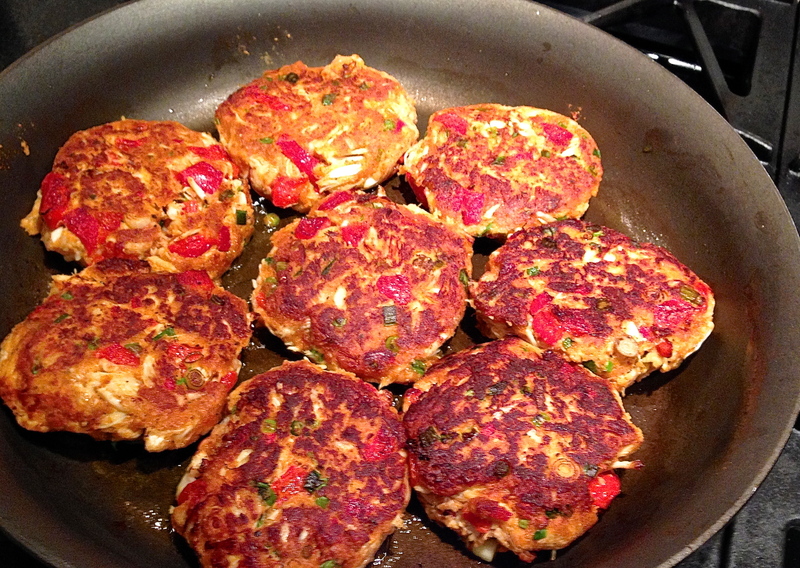 Note: These crab cakes can be served as hors d’oeuvre as well. Merely form the cakes in smaller pieces, yield 22 to 25.